While we grow some modern varieties, we specialize in heirloom or old variety apples. Many are not familiar with the names of these apples but you are encouraged to learn more about them and give them a try! Don’t let the unique shapes, mismatched sizes or weird colors & names scare you! Most of these great varieties have gotten lost in the massive advertisement and production of modern apples. Blended varieties make the best flavored sauces, pies and juices. You will not be disappointed! For a full list of varieties we maintain at our orchards, see our varieties page. We maintain and manage several small orchards around St. Lawrence County. 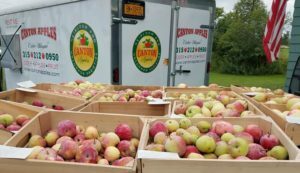 Our U-pick & Orchard Store is located on the corner of County Road 25 and Barnes Road in Canton, NY. There, we sell our apples u-pick & pre-picked and also sell ‘others’ apples which we did not grow to offer a larger selection for our customers. We anticipate an opening around the beginning of September, stay tuned! Our U-pick and Orchard Store is located at the corner of County Route 25 and Barnes Road – Look for and follow the signs!